Demographically our population is aging, as the so-called Baby Boomers pass into retirement. Active boomers are hopeful to remain in their homes as long as possible, even after mobility and other skills diminish. 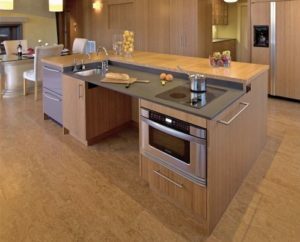 The design movement to address these life transitions is called Universal Design, and incorporates details, small and large, to anticipate the future abilities of a home’s occupants. Another population, veterans from the recent wars in Iraq and Afghanistan have also returned home. Of these veterans, many more than in previous conflicts have survived traumatic and sometimes extreme injuries. Missing limbs, blindness, prosthetic or wheelchair mobility and head trauma all affect how veterans and their families experience daily life. Nowhere is that more apparent than inside the home. 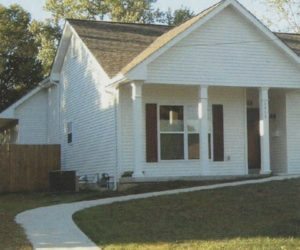 The Gary Sinise Foundation is among many wonderful organizations that have taken up the challenge of designing homes that allow veterans and their families to live comfortably and independently, without the look and feel of a rehabilitation facility. 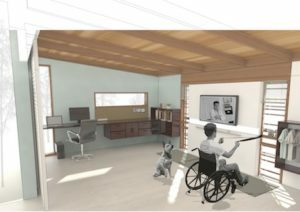 Both Universal Design and Wounded Warrior home design intersect, as they often need to overcome the same obstacles resulting from different causes. An aging hand has limited strength and mobility to open a door and so lever-type handles make that much easier. A vet using a prosthetic arm may find a similar design to effectively open a door. home are hallways and doors wide enough to accommodate wheelchairs or scooters — usually a minimum of 36”, but optimally 48” wide so that wider doors and trim work can be fitted for a more natural appearance. One advantage of new construction for universal or disability access is that designing in advance is much easier than retrofitting. One example of advance access design is the entrance to the home. The common retrofit solution is ranks of ramps, often in two directions to navigate the difference in ground level and threshold. But if grading and walkway design is addressed at the outset, gentle ramping can take the place of bulky, multiple passage ramp installations. It’s important to note that for most wheelchairs, that a threshold lip of an inch can be a significant obstacle to wheel over. Smoothing over entrance thresholds can make a huge difference! We’ve covered smart home technology before—home systems that can be monitored and controlled using a smart phone or tablet. Imagine how liberating it must be to be able to control a window shade, ceiling fan, furnace or air conditioner for an amputee veteran. These features allow many vets to control their environment independently without asking for help. These types of smart systems can also be terrific for seniors who want to remain in their homes even after declining mobility or a surgical procedure, like a knee replacement. While some literacy with computers is helpful, smart appliances and touchscreen controls are designed to be intuitive and easy. Emerging tech in the form of voice-controlled systems like Siri, and Amazon’s Alexa can provide voice command service for entertainment, communication and environmental controls. Employing adjustable options if space is an issue. The Ad-As height-adjustable cooktop kit provides a motorized option that can accommodate any standard 30” cooktop unit. Installing lower level cabinets that have pocket doors in place of swing-open doors. Hafele America has pivoting pocket door hardware as well as other “disappearing door” options. Designers for wounded warriors needed to talk to their veterans about some of the most private parts of their lives— including bathroom access. The result is accessibility that is functional but not clinical looking. 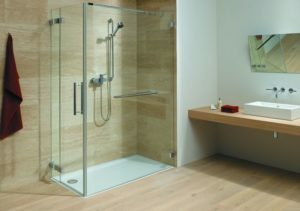 A stunning no-threshold shower is aesthetically pleasing but when equipped with beautiful tile, well-designed handles and grab bars, adjustable or multiple showerheads, it can also be accessed by a wheelchair. Other accessibility tools can be tucked into niches or cabinets so that the overall feel is homey, not hospital. Katahdin’s signature design style that features open floor plans, multiple floor-to-ceiling windows, and main floor master suites make it easy to design with accessibility in mind— now or in the future. One element of the Wounded Warrior approach to housing allows for feeling included, yet setting aside areas for private time. Thus, many disabled veterans’ homes allow easy visual as well as physical access to the outdoors, combined with retreats that allow for mental rejuvenation and contemplation. They strive to make living and social interaction as natural and easy as possible. 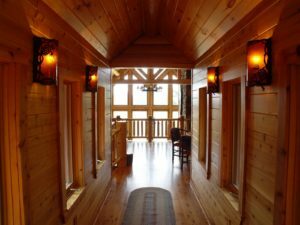 Most of the Katahdin Cedar Log Homes are custom designed from many popular floor plans with personalized tweaks. Because of this capability it’s easy to include elements that suit the needs of disabled veterans and their families, as well as customers who plan to remain comfortably in their homes well into their golden years. Ask us about our military discount!